The recent strike down of anticompetitive regulation in N.C. dental case opens the door to antitrust litigation against other state Regulatory Agencies such as Medical Boards. 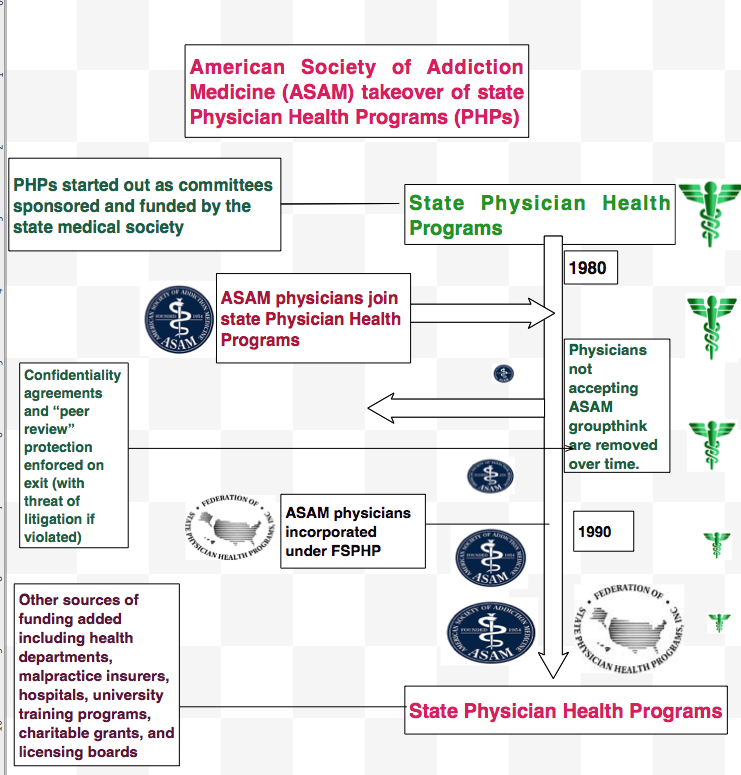 The Federation of State Physician Health Programs has set up a “hidden” system of coercion and control using various methods (policy and moral entrepreneurship, changes in state medical practice acts and administrative procedure, misuse of health law, etc.) to create a system that lacks oversight and regulation. As a power unto themselves they are accountable to no one. 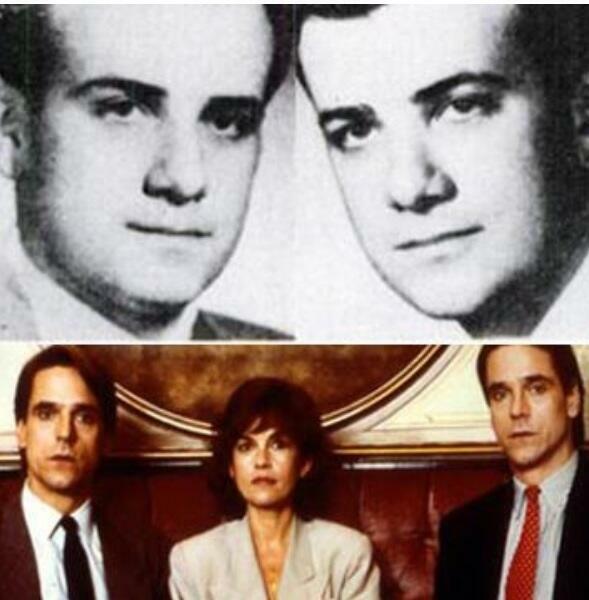 Although originally funded by medical societies and staffed by volunteer doctors in order to help sick colleagues and protect the public, any system can be subverted for profit and power, and these programs have been taken over by groups representing the multi-billion dollar drug and alcohol testing, assessment and treatment industry and become reservoirs of bad medicine and fraud. All manner of abuse can be hidden under a veil of benevolence. Although most are afraid to speak publicly under fear of punishment and retaliation (“swift and certain” consequences, summary suspension) I have herd from many many doctors in multiple states. Their stories are all the same. In addition to misconduct related to the non-FDA laboratory developed tests (they themselves introduced into the market using a loophole that bypasses FDA approval) there are reports of coercion into unneeded evaluation and treatment at a couple dozen or so “PHP-approved” facilities under threat of loss of licensure. Reports to a state PHP can be done anonymously with confidentiality guaranteed to the reporter. Any report will result in a meeting with the state PHP and if they feel a licensee is in need of an assessment they require it be done at a “PHP-approved” assessment center. As non-profit tax exempt corporations, PHPs do not provide clinical assessments. They can only recommend assessments. State Regulatory Agencies (Medical Boards, Nursing Boards, etc.) have accepted the PHPs requirements of limiting assessments to those approved by the PHP. In fact many states mandate assessments to solely “PHP-approved” assessment centers under threat of summary suspension of a professional license. 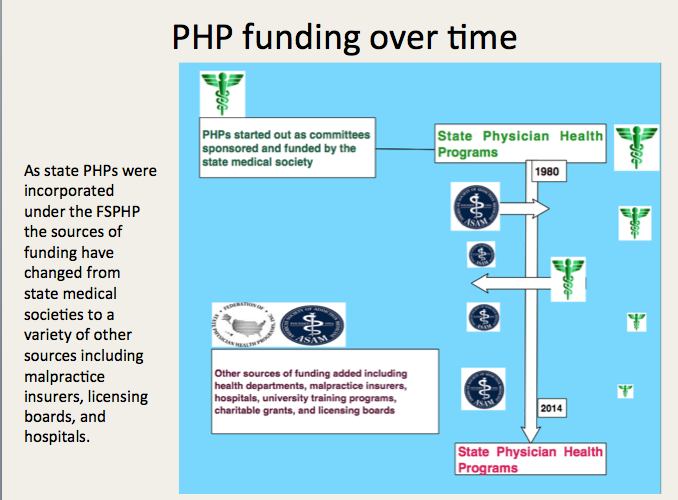 An Audit of the North Carolina PHP by State Auditor Beth Woods, however, found financial conflicts-of-interest in the use of these predominantly out-of-state assessment facilities to which the N.C. PHP was referring and the state Medical Board was requiring. Woods requested the qualitative indicators and quantitative measures used to “approve” these assessment centers from the N.C. PHP but they were unable to produce any documentation showing any quality indicators or objective criteria existed! The best response they could come up with was “informal” methods and “reputation.” The full audit can be seen here. Imagine if the FDA gave this reply if asked to provide the criteria used to “approve” medications or medical devices in the “FDA-approval” process! Making matters even worse, the Medical Director of the N.C. PHP, Dr. Warren Pendergast was serving as President of their national organization, the FSPHP at the time of the audit. The simple fact is no criteria exist. State referrals to “PHP-approved” facilities has become a matter of public policy. Both the American Society of Addiction Medicine and the Federation of State Medical Boards have issued public policy statements stating that only “PHP-approved” centers be utilized by Regulatory Agencies in the assessment and treatment of their licensees. Moreover, these policies specifically exclude “non-PHP-approved facilities and often involve a limited time-frame. No choice, no appeal and no bartering. Do it. Do it now and if you don’t suffer the consequences. These public policy statements can be seen in the 2011 ASAM “Public Policy Statement on Coordination between Treatment Providers, Professionals Health Programs and Regulatory Agencies” and the 2011 FSMB “updated Policy on Physician Impairment.” Many state Regulatory Agencies have strictly adhered to these policy recommendations. What this means is that states are mandating evaluations at “PHP-approved” facilities even though there is no documentable or plausible reason for doing so. No measurable criteria exist as to how the list of “approved” facilities were “approved” yet they have “cornered the market,” removed choice and created an imposed monopoly under threat of loss of professional licensure. In reality no official “PHP-approved” list exists. Neither does any objective published criteria for approving them. At the same time state Regulatory Agencies and Boards are forcing evaluations on licensed professionals at these couple-dozen or so facilities. They are excluding patient autonomy and choice violating the fundamental freedoms of the individual and informed consent. All semblance of due process has been removed. If a plausible reason existed (i.e. they met some minimum standard of credentialing, quality or patient outcome) for referring to a proscribed list of assessment centers it could be arguably justified. Without such criteria, and in light of the economic and ideological conflicts of interest involved, it is patently unjustifiable. Even more disturbing is, as Drs. John Knight and J. Wesley Boyd (who collectively have more than 20 years experience as Associate Directors at the Massachusetts PHP, PHS, Inc.) pointed out in their 2012 paper published in the Journal of the American Society of Addiction Medicine, many of these facilities are willing to “tailor” the diagnosis and recommendations of an evaluation to fit the wishes of the PHP. “Tailoring” an assessment and recommendations to anything other than what the true data show is healthcare fraud. It is, in fact, the political abuse of psychiatry. 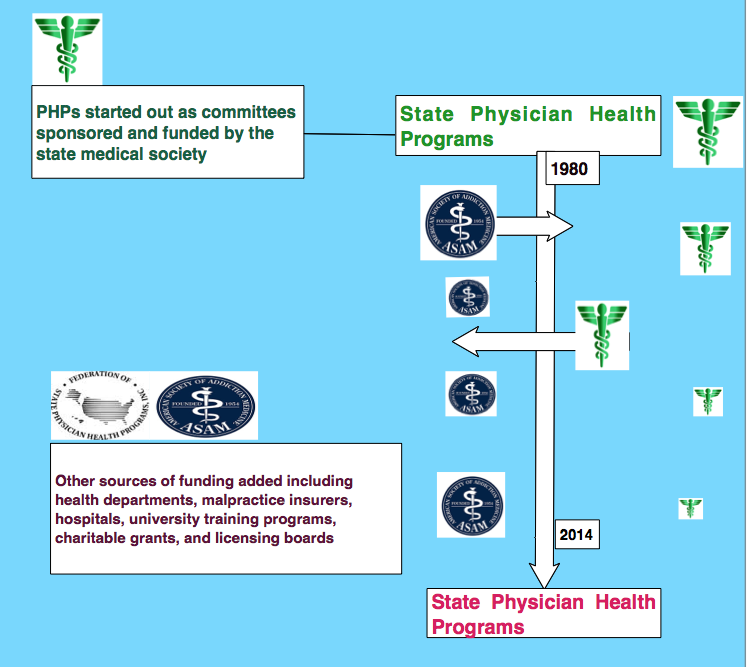 PHPs started out as “Physicians Health Programs” but many are transitioning to “Professionals Health Programs” to widen the net. For example in Michigan and Florida the state PHP covers all health care practitioners from Acupuncturists to Veterinarians. PHPs have also entered non -healthcare employee assistance programs (EAPs) such as the aviation industry and the grand plan is expansion to non-healthcare professions. They are doing this by claiming remarkable success rates and brandishing themselves as the “gold-standard” of substance abuse treatment. Interestingly, the same individuals claiming how successful PHP programs are are the same individuals profiting from the drug and alcohol testing they introduced. Anyone with any sort of license is at risk. So whether you cut hair, teach, take care of patients or even drive a car they could be coming after you next and they don’t have to convince you of the validity and reliability of their services–they only need to convince those who regulate your license and, as we have seen, they are very accomplished at persuasion in this department. And that is why we need more state audits of PHPs and Medical Boards. The starting point is simple. Request from the state PHP and Board a list of “PHP-approved” facilities and the criteria by which they were approved. What should be a simple reply will undoubtedly not be as they will not be able to provide either. Antitrust litigation hasn’t disappeared, but rather changed its focus. Instead of targeting the great railroad empires of the late 19th century, today’s antitrust efforts focus on more minute industries, like dentistry. In Bending Science: How Special Interests Corrupt Public Health Research 1 Thomas McGarity and Wendy Wagner describe how special interest groups scheme to advance their own economic or ideological goals by using distorted or “bent” science to influence legal, regulatory and public health policy. The authors describe a “separatist view” of science and policy that assumes scientific research is sufficiently reliable for public policy deliberations and legal proceedings when it reaches them. 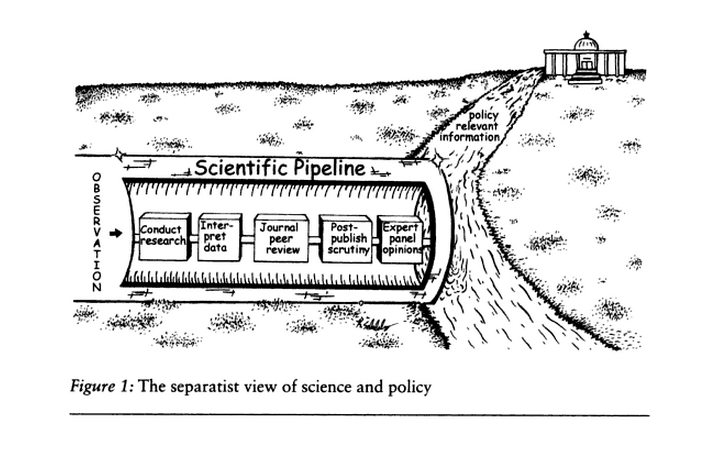 This is illustrated as a pipeline in which it is presumed the scientific community has properly vetted the information flow through rigorous peer-review and professional oversight. The final product that exits the pipeline is understood to be unbiased and produced in accordance with the professional norms and procedures of science. The reliability, integrity and validity of the final product is indubitably accepted. The separatist view does not consider the possibility that the scientific work exiting the pipeline could be intentionally shaped and contaminated by biasing influences as it flows through the pipeline. When this occurs the final product exiting the pipeline is distorted or “bent” and bent science can result in bad decision making and bad policy. Bent science starts with a pre-determined outcome and works backward from a desired result. It is not true science. Those orchestrating the deception (“benders”) use a variety of tactics and strategies to shape, package and spin science to support their own hidden agenda and suppress opposing science. Benders attempt to hide, dismiss and debunk contrarian research and unsupportive science. Benders will attack and harass the science and scientists that pose a threat to their interests. Using carefully crafted studies designed to confirm a desired outcome, the pre-determined conclusions are subsequently promoted and publicized to the relevant stakeholders who are often unable ( or sometimes unwilling) to discern real science from junk-science. Misinformation, propaganda, and deception are disseminated in a variety of venues. Public relations firms are used to manipulate public perception and freelance writers are hired brandish favorable consensus statements. Authoritative reviews and critiques are ghostwritten under the names of “outside experts” who profit both monetarily and by adding a high-profile publication to their resume. Opinion is paraded as fact and with a dearth of professional oversight the charade usually goes unnoticed and unopposed. Data-dredging, cherry picking, confirmatory bias, confirmatory distortion, fabrication, falsification, exaggeration, and a whole host of deceptive tactics are used to work backward from an already determined result. Any information that contradicts the answer is manipulated, undermined, suppressed or downplayed; even if it is the result of real science and evidence-based research; even if it is the truth. Professional procedure, protocol and ethics are off the table. It is an underhanded free-for-all. Bare knuckle boxing. Trash your opponents work and label it junk-science. Undermine the integrity of your opponents. Use ad hominem attacks to question the opponents motives. Claim the scientists are hacks on the take. Start rumors about them. Loudly claim you are the one who is evidence based. Proclaim professionalism and authority. Quibble. Move the goalpost. Nit-pick and split hairs. Proclaim over and over and over again you are the one who is evidence based. And the problem is it usually works. It is an unfair playing field. When no meaningful barriers are in place to detect cheating and identify cheaters they usually win. 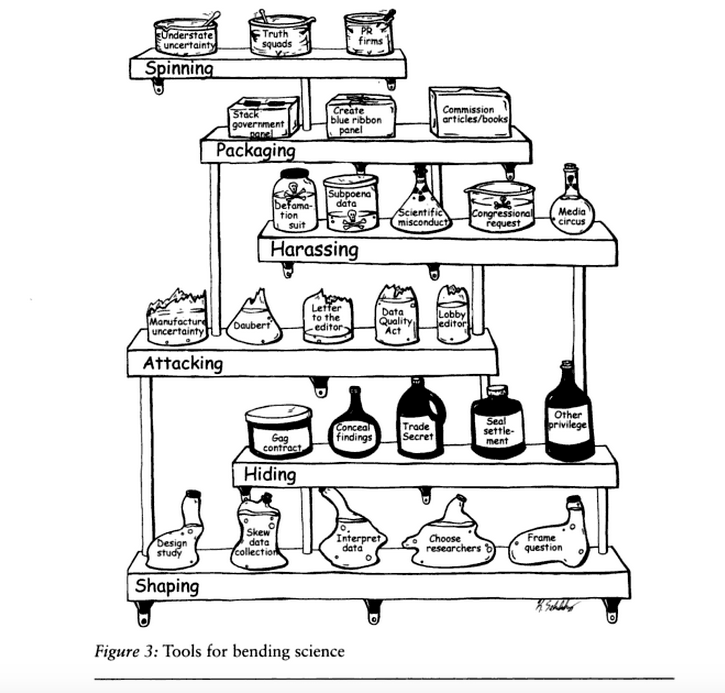 Bending science can have serious and sometimes horrific consequences and multiple examples including the Tobacco and pharmaceutical industry are given in the book. Calling for immediate action to reduce the role that bent science plays in regulatory and judicial decision making, the authors emphasize the assistance of the scientific community is necessary in designing and implementing reform. But there are difficulties in challenging bent science including a general lack of recognition of the problem. With an absence of counter-studies to oppose deliberately manufactured ends-oriented research this would be expected. Bent science involves the deliberate manufacturing of a pool of information designed to promote a specific agenda. A level playing field would require a pool of opposing research specifically addressing that agenda. In reality this requires both the incentive and the power to do so–an unlikely scenario short of an equally well funded competitor or sufficient public concern about the problem. And part of the “art” of bending involves swaying public opinion and the mainstream media is typically aligned with the benders so opposing viewpoints seldom make the headlines. Additionally, there is no meaningful oversight or avenue to pursue accountability. No systems exist to prevent, catch and publicly expose bent-science or those who bend science. 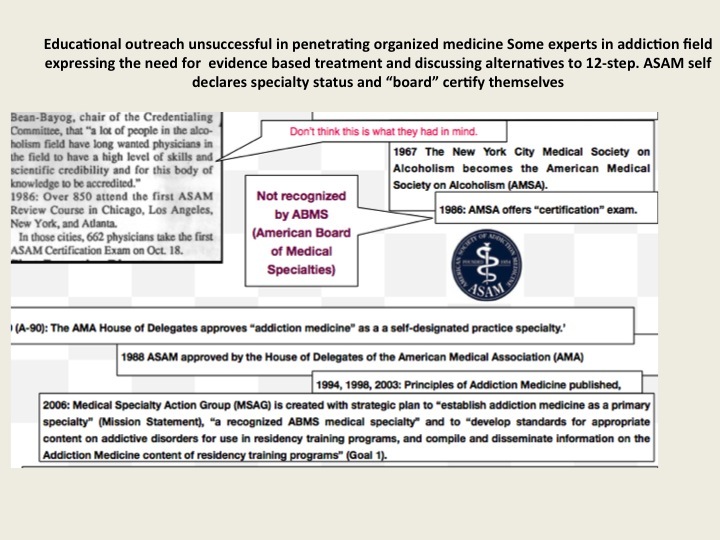 The influence of special interest groups on the practice of medicine is unknown. No one has examined the role of bent science in the rules, regulations, policies and decisions made by those who are in charge of the standards of medical practice and professional behavior of doctors but as a regulated profession governed by the decisions and policies of regulators it is certainly possible. Administrative law is the body of law that allows for the creation of public regulatory agencies and contains all of the statutes, judicial decisions and regulations that govern them. Administrative agencies implement their powers in the form of rules, regulations, orders and decisions. 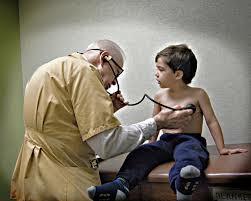 State medical boards are the regulatory agencies responsible for the licensure and discipline of physicians. They grant the right to practice medicine in the form of a medical license and each state has Medical Practice Act that governs and defines the practice of medicine. The medical board is empowered to take action against a doctor for substandard care, unprofessional behavior and other violations as defined by the state Medical Practice Act. Administrative Code governs the licensure and disciplinary process and the State Administrative Procedure Act governs the legal process (due process, discovery, etc.). Regulatory changes are enacted through procedural, interpretive and legislative rules. Both medical practice acts and administrative procedure acts are subject to change. Changes in medical practice acts can redefine what is acceptable practice and what constitutes professional behavior. This can increase the power and control these agencies have over doctors both professionally and socially. Changes in Administrative practice acts can decrease what rights a doctor has if this power and control is abused. Changes in the wording of administrative code and administrative practice acts can have profound implications in these rights including due-process, timeliness of being heard, rights to appeal decisions and time-constraints for judicial review. And when these changes occur they do so silently. The hand that directs the machine is indeed invisible. The consequences, however, are not. These changes not only impact those touched by the hand but can have a systemic impact on the entire profession. 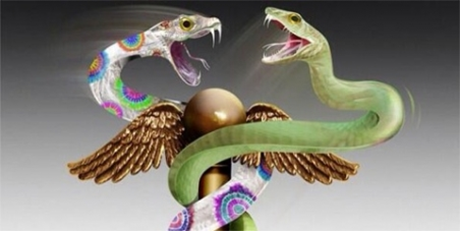 State medical practice acts as well as administrative practice acts and code are susceptible to change and therefore susceptible to the influence of special interest groups benefitting from such change. Regulation of the medical profession is thus susceptible to bent science. The impact of bent science on the regulation of the medical profession has not been studied. As a profession governed by regulatory agencies medicine is certainly not immune to the influence of special interest groups who could in turn influence public policy and regulatory decisions, rules and regulations to benefit their own interests. Making sound decisions about regulation calls for an understanding of the problem it is intended to solve. This demands methodologically sound science and evidence-based facts arrived at through rigorous peer review and professional oversight. The science on which policy decisions are made must be reliable and unbiased. Legitimate policy must be based on recognized and legitimate institutions and experts. If the information regulatory agencies rely on to discipline doctors and protect the public is unreliable then serious consequences can occur. It would be beneficial to look for changes in public policy, guidelines, rules and regulations involving the medical profession and examine the reasons behind them. When did the problem present? Who presented it? Was it based on methodologically sound and accurate data? What organizations do the problem presenters represent? What organizations or individuals aligned or associated with the presenters might benefit? What are the consequences? Who is harmed? The mechanics and mentality is similar to the science benders and, as discussed below, they use some of the same techniques. Moral entrepreneurs take the lead in labeling a particular behavior deviant and spreading this label throughout society. They associate the behavior of some group with a society evil, affix an easily recognizable label to it and then express the conviction that the evil must be combated. Labeled as being outside the central core values of consensual society, the deviants in the designated group are perceived as posing a threat to both the values of society and society itself. As a result any bent science directed at regulatory and public policy decision making should be clearly visible. The sociologist Stanley Cohen used the term ”moral panic” to characterize the amplification of deviance by the media, the public, and agents of social control.7 According to cultural theorist Stuart Hall, the media obtain their information from the primary definers of social reality in authoritative positions and amplify the perceived threat to the existing social order. 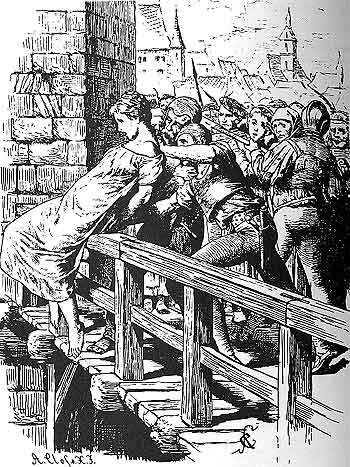 The authorities then act to eliminate the threat.9 The dominant ideas or ideologies are reproduced by relying on the opinions of the defining authority and then spread through the media. An internet search of what labels have been affixed to doctors in association with a threat to society there are three. A google search of “impaired physician” yields 20, 600 results; “disruptive physician” yields 17, 400 results; and “aging physician” yields 27, 800 results. A large number of these articles, opinion pieces and reviews associate impaired, disruptive and aging physicians with patient death and other adverse events, medical error, and malpractice. The labels affixed to these physicians have been characterized as a major threat to public health and the rhetorical tools used in many of these articles seems aimed at increasing public anxiety. A PubMed search yields 154 results for the “impaired physician”; 47 results for the “disruptive physician”; and 19 results for the “aging physician.” Many of these are opinion pieces written by the same group of physicians and aimed at hospital administrators, regulators and those involved in the legal or business aspects of medicine. There is, in fact, no evidence based research that associates the impaired, disruptive or aging physician with any adverse events. The “impaired,” “disruptive” and “aging” physician labels as evinced by a quick google search seem escalated far beyond the level warranted by the existing evidence. The “impaired” and “disruptive” labels have taken on the status of moral panic and the “aging” label, which is being associated with cognitive impairment, seems to be heading in that direction. The number of articles being published and lectures being given on the dangers of cognitively impaired doctors is increasing. It has not yet reached the level of public awareness the impaired and disruptive have. To acknowledge that the current level of concern about these labels is exaggerated is not to suggest they do not exist. They do. But the disparity between the evidence-base, or lack thereof, and the level of concern warrants further investigation. 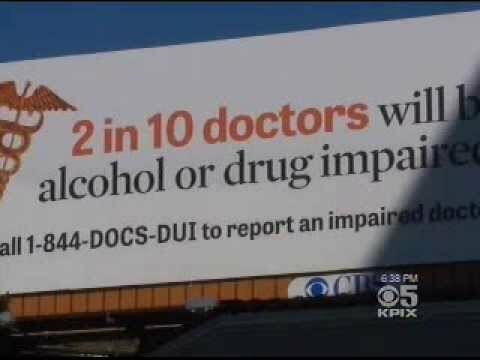 To be clear, doctors who are impaired by drug and alcohol abuse need to be removed from practice to protect the public and receive treatment; doctors who are abusive to others or engage in behavior that threatens patient care need to be held accountable for their actions; and doctors who are cognitively impaired due to dementia need to be removed from practice and evaluated by the proper specialists. If a diagnosis of dementia is confirmed then they need to be removed from practice. What is the motivation behind the “impaired,” “disruptive” and “aging” physician labels and the multiple articles linking these labels to patient harm and medical error? There is no data driven evidence so where does it come from? Could moral entrepreneurs be behind it? If so then there should be evidence of bent science and to examine this we must look for evidence that these labels have been used to influence regulatory decisions, rules, regulations and policy. And with the recently archived Journal of Medical Regulation this task can be easily accomplished. The Federation of State Medical Boards (FSMB) is a national not-for profit organization that gives guidance to state medical boards through public policy development and recommendations on issues pertinent to medical regulation. Shortly after its founding in 1912, the Federation of State Medical Boards began publishing a quarterly journal addressing issues relating to medical licensing and regulation of doctors. First published in 1913 as the Quarterly of the Federation of State Boards of the United States, the publication has undergone several name changes and publication schedules. From1921 to 1999 it was published monthly as the Federation Bulletin. In 1999 it was changed to the quarterly Journal of Medical Licensure and Discipline and in 2010 was revised to the Journal of Medical Regulation The Journal of Medical Regulation is in the process of archiving all issues dating back to 1913. Presently every paper dating back to 1967 is available online and the archival organization and availability of full articles published sequentially over the past half-century is historically invaluable. 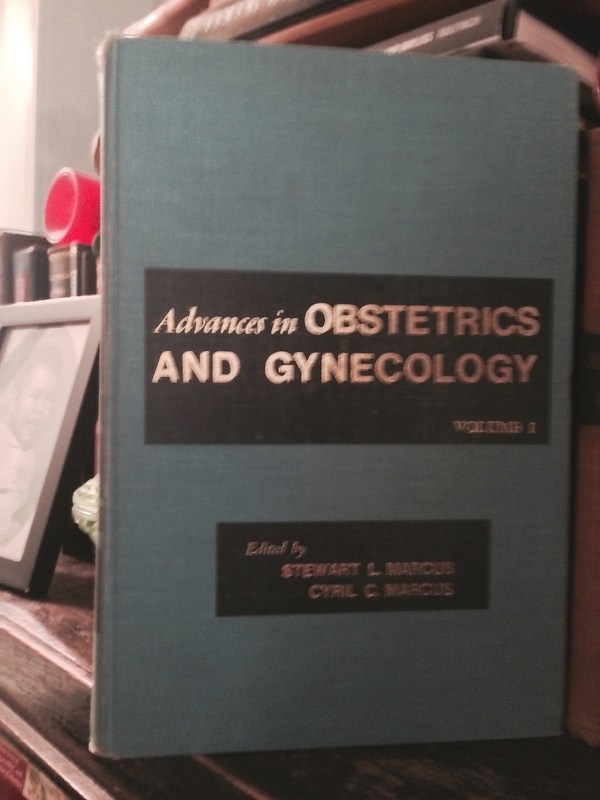 As the official journal of the national organization involved in the medical licensing and regulation of doctors, this archival organization allows for an unskewed and impartial examination in both historical and cultural context. We can identify when particular issues and problems were presented, who presented them and how. The Journal of Medical Regulation archives provides a structured context to examine these issues in their historical and cultural context. This facilitates a retrospective analysis. As a timeline it allows identification of when the issues were presented. It also allows us to look at the events preceding the problem, who benefited from them, and the consequences. Could these factors be involved in influencing the regulation of medicine and shaping the medical profession? Could bent science have been involved in regulatory and administrative changes that have significantly impacted the rights and well-being of doctors and how the profession of medicine is defined? Could some of the current problems such as the marked increase in physician suicide, sham-peer review, and physician burnout be the result of bent science? If bent science is contributing to bad policy and bad decision making then it need to be exposed and addressed. Bent science is bad medicine and if it exists then we need to urgently shine a light on it. McGarity TO, Wagner WE. Bending Science: How Special Interests Corrupt Public Health Research. Cambridge, MA: Harvard University Press; 2008.
de Toqueville A. Democracy in America. New York: Penguin Books; 1984. Blumer H. Social Problems as Collective Behavior. Social Problems. 1971;18:298-306. Stone DA. Causal Stories and the formation of policy agendas. Political Science Quarterly. 1989;104:280-300. Best J. Threatened Children, Rhetoric and Concern about Child Victims. Chicago University of Chicago Press; 1990. Gerbner G, Gross L. The scarey World of TV’s heavy viewer. Psychology Today. 1976;9(89):41-45. Cohen S. Folk Devils and Moral Panics: The Creation of the Mods and Rockers (New Edition). Oxford, U.K.: Martin Robertson; 1980. 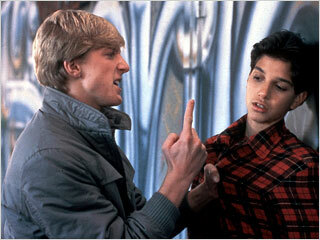 Becker H. Outsiders: Studies in the Sociology of Deviance. New York: Free Press; 1963. Hall SC, Critcher C, Jefferson T, Clark J, Roberts B. Policing the Crisis: Mugging, the State, and Law and Order. London: Macmillan; 1978. 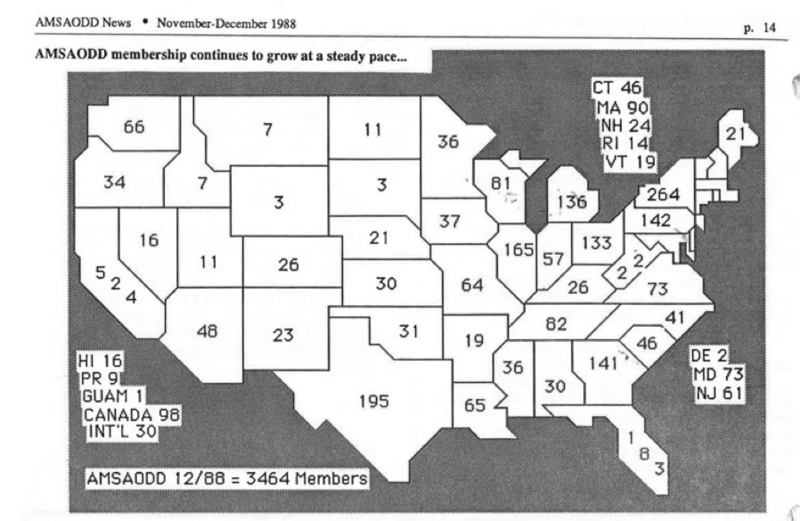 In 1985 ASAM’s first certification exam was announced. 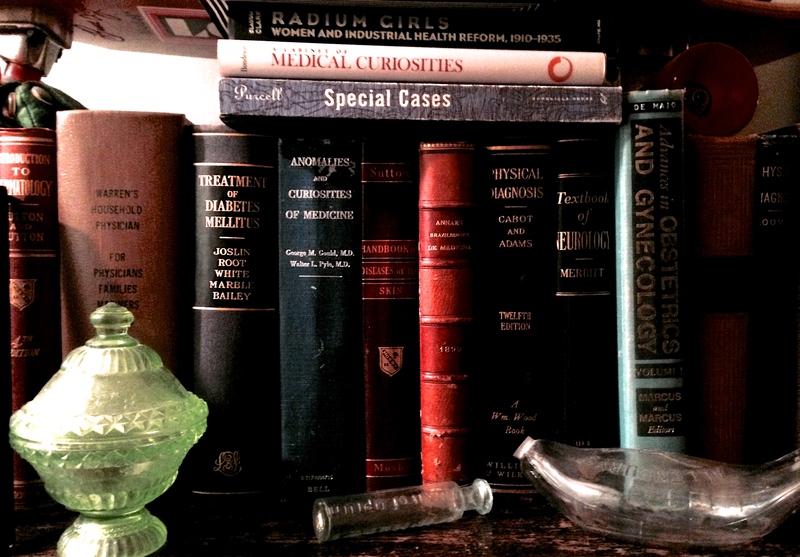 According to Dr. Bean-Bayog, chair of the Credentialing Committee, “a lot of people in the alcoholism field have long wanted physicians in the field to have a high level of skills and scientific credibility and for this body of knowledge to be accredited.”2 And in 1986 662 physicians took the first ASAM Certification Exam. The sick physician. Impairment by psychiatric disorders, including alcoholism and drug dependence. JAMA : the journal of the American Medical Association. Feb 5 1973;223(6):684-687.